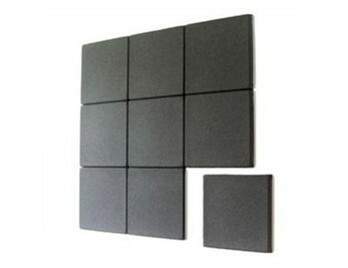 Acoustic wall panels are brilliant way of addressing noise pollution within the workplace as they can be easily installed and look aesthetically pleasing due to the various shapes and finishes they are available in. They are highly effective as they can cover large sections of wall or flat surface, almost instantly reducing and absorbing and reducing and noise and echo which may have been reverberating previously. Due to their flat surface, some wall panels and tiles can substitute art work as imagery can be printed on to some acoustic fabrics which like paintings canvas stretch over a wooden framework. BuzziTile 3D turns any wall into a colourful acoustic display, a real must see! Unleash your creativity by combining different coloured fabric tiles and shapes to build your own sound proof wall with ease. BuzziTile 3D is a fully customisable acoustic solution and is available in a variety of interesting shapes and geometric patterns that will wow your visitors and colleagues. Please refer to downloadable specification guide for pattern detail. 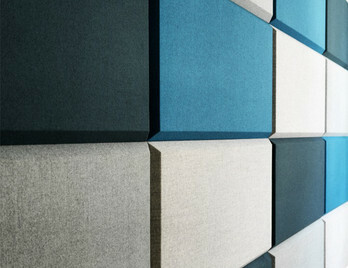 Domo Wall Panel is a unique wall-mounted sound absorber with bevelled edges. It's available in rectangular and square-shape formations which means you can create symmetrical or asymmetrical pattern formations. The panel is hung using concealed brackets making a seamless connection to the wall surface. 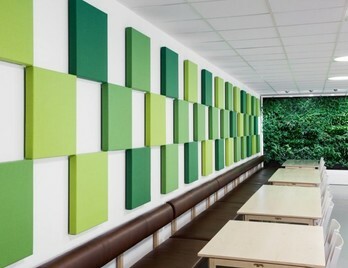 Frame less acoustic wall panels available in a wide range of colourful fabrics. 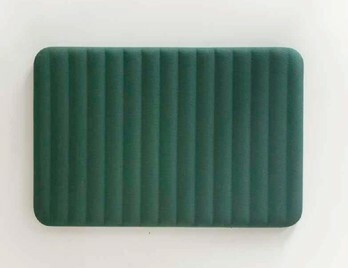 These tiles are 38mm thick and are filed with acoustic foam which will absorb around 85% of direct sound. Manufactured in the UK for a 10 -15 day lead time. 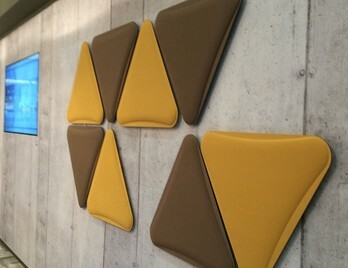 The Vox triangular panels are 40mm thick thermobonded polyester fibre foam moulds wrapped in a commercial grade fabric and available in six colour finish options. The tear-proof edges of Vox Wall panels are laser cut and extremely rigid which gives them a futuristic appearance with subtle detailing. Vox Wall panel can be configured in a number of modular configurations on both wall or ceiling and can incorporate striking LED lights, it’s an extremely versatile acoustic system with a bright future! 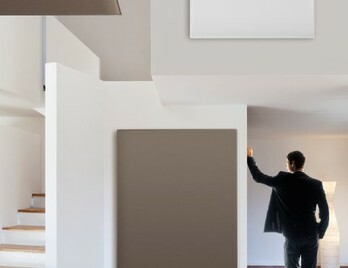 The Oversize Wall panel is characterised by the large sound-absorbing panels made with Snowsound® technology that can either be mounted on the wall or the ceiling. 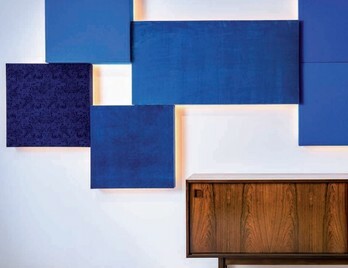 Mitesco Panel is an aesthetically pleasing acoustic wall panel from the Mitesco family. These panels have visible hi-tech polymer front connectors in either grey or white. The panel is available in three different heights. 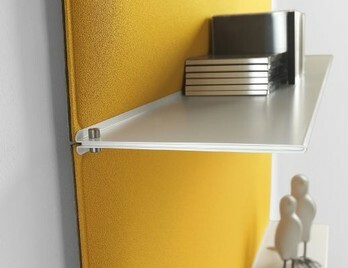 With Blade Panel you can make use of the joins between each panel with the use of the designer slimline powder coated steel shelf or shelves. The panel or panels have polyester internal padding with Snowsound® Technology variable density and can be combined to create your own bespoke acoustic shelving system. Acoustic tiles from the Eden range available in a wide selection of fabrics in a decorative fan shape. 40mm thick and supplied with keyhole brackets. 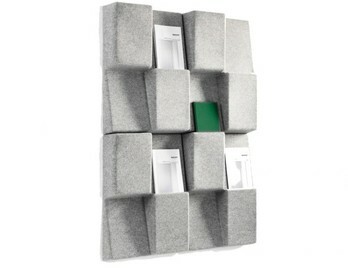 Velcro or magnetic mounting is available on request. Snowall is made up of polyester felt paired with polyester Trevira CS® material which uses a unique application system. 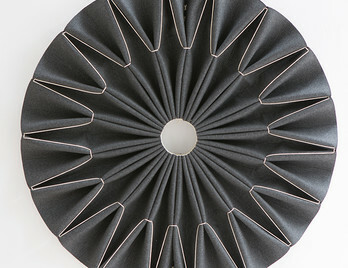 The felt lining and the absent space between the two materials reduces the tendency for dust and pollen. 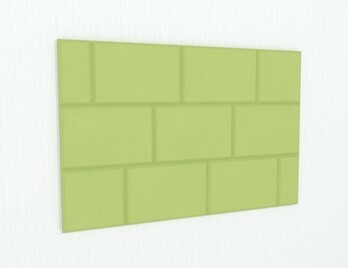 BuzziSkin cuts add more punch to your wall and can be arranged with different shaped combinations. 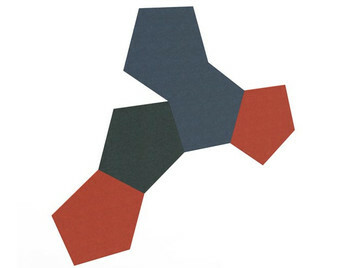 Each shape has a self-adhesive back which gives you peace of mind when it comes to fixing the shapes to your wall. 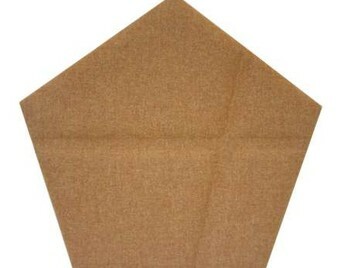 12 pieces are supplied per box in the same fabric. Please contact us if you want variations of colours. The concept behind Hussh Panels is that they are designed strategically to minimise excess noise (echo) as they can be positioned easily are available in 6 different sizes and can be hung from the wall or ceiling using suspension wire either vertically of horizontally. Fabric combinations can also be implemented across this range making them a design feature if hung vertically by wire or on the wall. 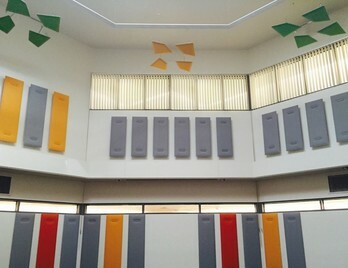 BuzziTile Flat turns any wall into a colourful acoustic display, a real must see! Unleash your creativity by combining different coloured fabric tiles and shapes to build your own soundproof wall with ease. 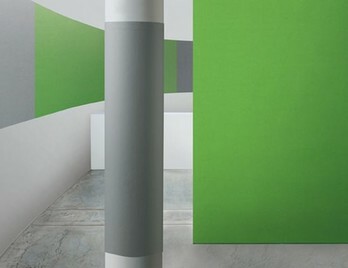 BuzziTile flat is a fully customisable acoustic solution and has a plain smooth surface. If however, you want to take your creativity up a notch then check out BuzziTile 3D with a vast array of interesting 3D moulded patterns. BuzziTile 3D stone turns any wall into a colourful acoustic display by replicating brick and stone wall formations. Unleash your creativity by combining different coloured fabric tiles and shapes to build your own soundproof wall with ease. BuzziTile 3D stone is a fully customisable acoustic solution and is from the BuzziTile range available in a variety of interesting shapes and geometric patterns that will wow your visitors and colleagues. Please refer to downloadable specification guide for pattern detail. 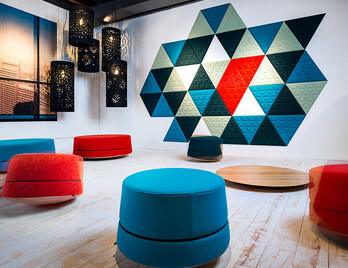 BuzziTile 3D Hexa turns any wall into a colourful acoustic display, a real must see! Unleash your creativity by combining different coloured fabric tiles and shapes to build your own sound proof wall with ease. 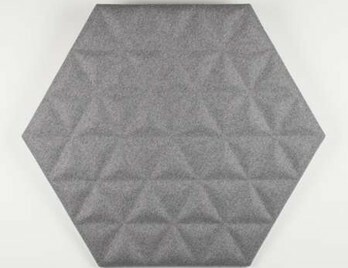 BuzziTile 3D Hexa is a fully customisable acoustic solution and is available in a variety of interesting shapes and geometric patterns that will wow your visitors and colleagues. Please refer to downloadable specification guide for pattern detail. BuzziTile 3D Penta turns any wall into a colourful acoustic display, a real must see! Unleash your creativity by combining different coloured fabric tiles and shapes to build your own sound proof wall with ease. BuzziTile 3D is a fully customisable acoustic solution and is available in a variety of interesting shapes and geometric patterns that will wow your visitors and colleagues. Please refer to downloadable specification guide for pattern detail. 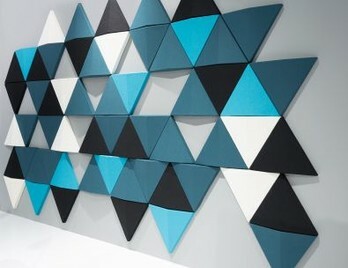 BuzziTile 3D Triangle turns any wall into a colourful acoustic display, a real must see! Unleash your creativity by combining different coloured fabric tiles and shapes to build your own soundproof wall with ease. The BuzziTile 3D range is a fully customisable acoustic solution and is available in a variety of interesting shapes and geometric patterns that will wow your visitors and colleagues. Please refer to downloadable specification guide for pattern detail. 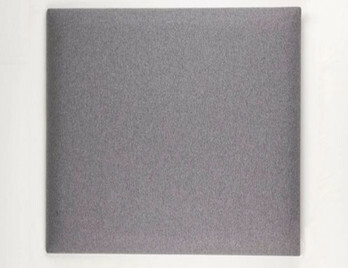 BuzziPod is an acoustic panel and baffle designed to break and absorb sound and ambient noise often created within larger offices, breakout areas, canteens or high traffic areas. BuzziPod can multitask as it is able to be suspended from the ceiling or fixed to the wall, looking stylish and chic whilst performing to a high acoustical capacity. 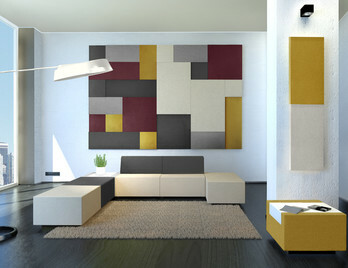 BuzziPod is available in three different patterns to add texture and interest to each space. BuzziPleat is a fusion of old and new and reinterprets ancient techniques in fashion design, like smocking and pleating and applies them to large-scale, lightweight sculptural forms. 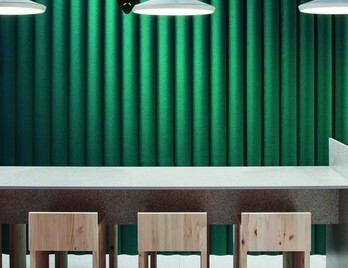 The pleats are made for sound absorbing BuzziFelt and the folds maximise surface area and sound absorption. The collection includes two styles Ripple and Edel both can be fixed to the wall or suspended from the ceiling. 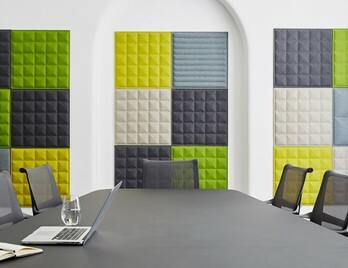 Not all acoustic panels and tiles are flat, some are moulded and ‘pushed out’ in angular forms which gives an angular surface of multiple sides, effectively absorbing and reflecting excessive noise in different areas and directions. Many wall tiles come in hexagonal, triangular or circular shapes, and when combined together can create some visually interesting patterns. Coloured and textured fabrics also can enhance a brand by reinforcing colours which are synonymous to the organisation. Some tiles can also be used as signage with arrow shaped panels directing people in a playful way whilst contributing significantly to the acoustics of the entrance or corridor. Tiles and panels are also relatively easy to install and can be fixed to the wall in a number of ways such as wooden battens, magnets, velcro or wall spikes. These methods are classed as ‘secure fixing methods’ which is necessary to ensure that the panel will not be moved once mounted on to the wall. The other method is ‘basic wall mounting’ where you would simply fix a nail or secured screw in to the wall and hang the panel by the rear frame. This is simply the method you would employ to hang a picture, clock or small mirror and some panels come with fixings holes on the back to allow this. 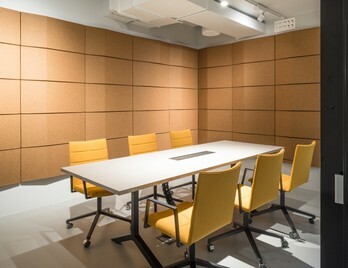 Wall panels are usually 40mm thick and have been tested in some cases to help absorb at least 85% of excess noise and reverberation this will almost certainly help create a more ambient workplace and enhance productivity for the workforce.